Last week Kelsey made my dreams come true! Actually, it was an incredible culmination of efforts from our program staff, and Kelsey was able to put the technology into action! WE HAVE A COMMUNITY CALENDAR! But, more than a community calendar - we have six months of educational events on our community calendar, our support groups, our early stage Alzheimer's activities, Caregiver University, and our regional nursing home 2-hour OHFLAC training. If you didn't click on the link above to check it out - DO IT NOW!! O.K., so you may not be as excited as I am. But, it has been my dream to have a one stop place for people to find ways to learn about Alzheimer's, caregiving and support. But, we need your help! Please share our education and support opportunities with your friends, neighbors, co-workers, Facebook friends, church community - anyone in your circle! Now to make my next dream come true...online video education & support! Stay tuned! Charleston - Early Stage Alzheimer's PotLuck on Wednesday at 4 pm. This is an event for individuals in the early stage of Alzheimer's, this is a great opportunity to meet others who are also facing the Alzheimer's or dementia journey. For more information call, 800.272.3900. Morgantown - Conversations About Dementia workshop at 10:30 am. This great workshop will cover Driving, Diagnosis and Safety. For more information call 800.272.3900. Support Group Changes - due to the holidays a number of support groups will be changing their date/time in December. Please check our calendar for changes! Holiday Hours: Our offices in Charleston, Parkersburg and Morgantown will be closed on Tuesday, December 24 & 25 in celebration of Christmas. Our offices will also be closed on Wednesday, January 1 in celebration of the NEW YEAR! Throughout the ENTIRE holiday season our 24/7 Helpline (800.272.3900) will be available. I went to the grocery store tonight and came out with two potatoes, sprinkles, bananas and breakfast bars. Absolutely nothing that makes a meal! Do you ever go to the grocery store and just kind of wander around? There is something about that place that makes me completely lose all rational thought - sprinkles? Really? Normally I would just make it a cereal night, but I was also responsible for feeding W - and he isn't too keen on the cereal for breakfast like us single-for-a-really-long-time gals are. When it is cold there is nothing better than steaming hot vegetable soup, but what makes this recipe so easy is how you serve your soup! This recipe is a great empty the freezer meal. This is also a great meal for when you don't know exactly when you will need dinner ready. The soup is great to sit and simmer on the stove and will heat up the potatoes as soon as you pour it over them. Bake your potatoes for an hour at 350 degrees or until a fork will easily pierce them. While your potatoes are baking, brown stew meat in a large saucepan or stockpot. Depending on how many people you are feeding. For W and me, I browned about 1/2 pound. Add 1/2 can of tomato paste. You really want this stew to be think since you are going to spoon it over your potato. Season the meat and tomato paste mixture with onion powder (add onions and garlic if you have them on hand! ), salt and pepper (a lot of pepper). Fill the pot until there is about 1" of water over the meat. Then add your favorite fresh or frozen vegetables. On hand I had carrots, corn and green beans - but any combination will work. Add your favorite herb combination, I chose rosemary and thyme. 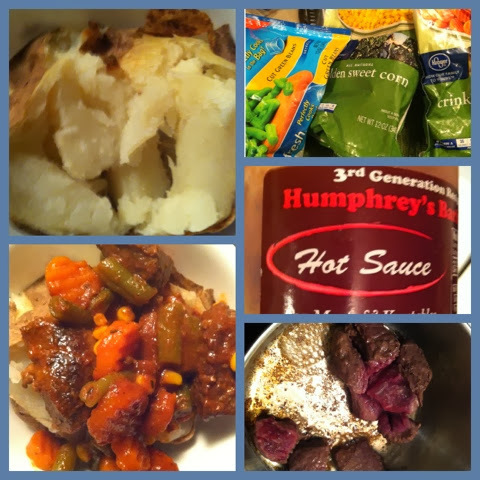 And then of course for a little heat added a gulp of Humphrey's! Allow the mixture to come to a boil, then simmer for at least 30 minutes. The longer the better! When you are happy with the consistency, open up your bake potatoes and pour in the soup!